As you enter through the front door, you walk into a piece of Auburn&apos;s history. 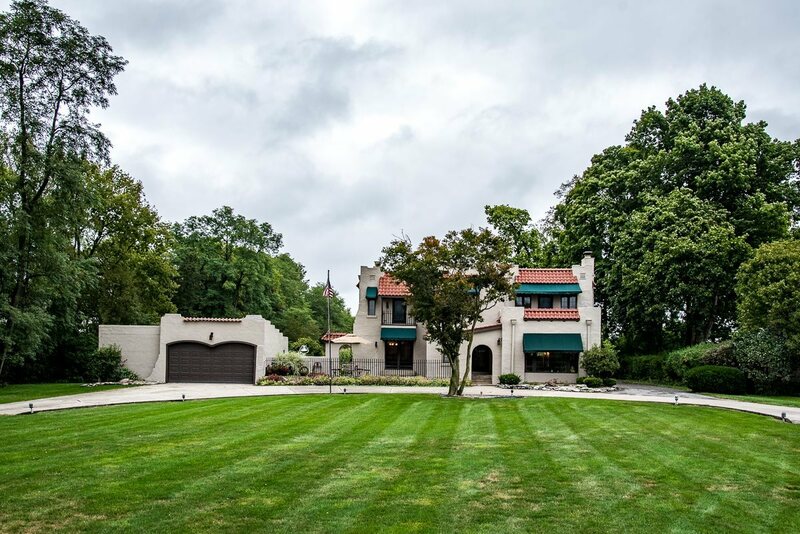 Designed and built by Rollie Muhn, details surround the home with custom concrete Italian floor tiles, wrought iron fixtures, fieldstone fireplace, hand painted wooden beams, open staircase in foyer and arched doorways with gorgeous oak doors. The current owners have restored and kept many of the original features of the home. A large kitchen, LR, den and DR provides ample amount of gathering space. The peaceful backyard is wonderful for summer evenings, by the pool and watching all that nature has to offer. Outdoor amenities include a heated pool w/diving board and electric cover, 2 large patios, 2 covered porches, balconies, a pool house and a workshop attached to the garage. An oversized sliding door in the DR leads you out to a covered patio which is equipped with a TV. Recent updates include: back roof 2018, main roof 2015, furnace 2017, and a heated pool and concrete 2015. 4 BR and 2 1/2 baths complete this amazing home. $15, 000 flooring allowance.